eggless mawa cake recipe - cardamom spiced eggless buttery cake with a caramelized milky flavor. made with mawa or khoya, whole wheat flour and butter. grease a 7 to 8 inches round pan with butter. dust some flour on it. shake and tap the pan so that the flour spreads evenly. you can also line the cake pan with butter paper or parchment paper. grease some butter on the butter paper or parchment paper. crumble the mawa and keep aside. you can also grate the mawa. take butter and sugar in a bowl or pan. cream butter and sugar till light and fluffy. you can use a stand mixer, food processor or an electric beater to cream the butter and sugar. add the crumbled mawa and mix very well. then add the flour sieved with baking soda and baking powder directly into the cake mixture. sprinkle the cardamom powder. pour the milk and cream. fold everything till the flour, milk and cream are incorporated well in the cake batter. pour the mawa cake batter in the prepared cake pan. place the pan in the pre heated oven at 180 degrees C and bake mawa cake for 45 to 1 hour, till you the top is browned and a tooth pick inserted in the cake comes out clean. if baking cupcakes, then just bake for 20 to 25 mins or till the tops are browned. allow the mawa cake to cool down. 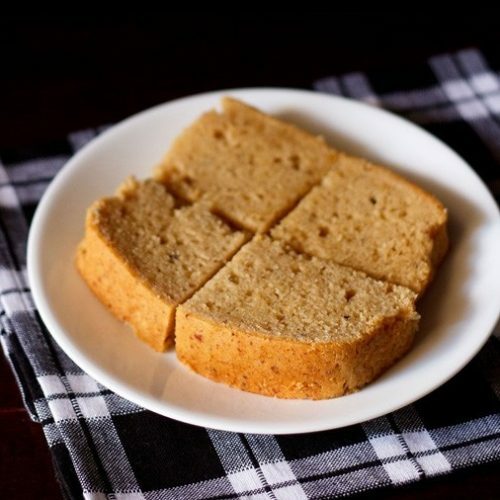 slice the mawa cake and serve plain with tea or coffee.